The Sahara Desert is a place you really can not skip when you are visiting Morocco. Sahara Desert tours are organized by many companies and there are loads of possibilities in order to fit it into your itinerary. The Sahara is an area of 9.4 million square kilometers, which is the same size as the United States! Our tour started in Fes because we came from Chefchaouen, the blue city. The tour is also available from Marrakech as a return. Be prepared for a lot of driving but the sceneries and sights you will visit will make it up to you. Or directly read more about how to pick a Sahara Desert Tour. From Fes, we left around 8 AM and the driver took us to Merzouga that day. Merzouga is the city that is located at the beginning of the Sahara. On our way, we’ve stopped several times. Once arrived in Merzouga you will change the car to a four-wheel drive vehicle which takes you to your camp just in time to see the sunset. We decided to go glamping, which is sleeping in a tent but way more luxury. KamKamDunes was the camp we booked in advance. That night we had a great dinner, played music together and looked at the millions of stars from the dunes. The next morning you will be awakened very early to get out, hop on a camel and get to the top of a dune. Once on the top, the sun will rise from the horizon, temperatures rise quickly and all the dunes get these beautiful soft orange color. Also, see the 10-day Morocco Route. After breakfast, you will leave in the direction of Marrakech. You will pass and stop at several sites like Tenhir, Tinjdad, Jorf, and Erfoud. 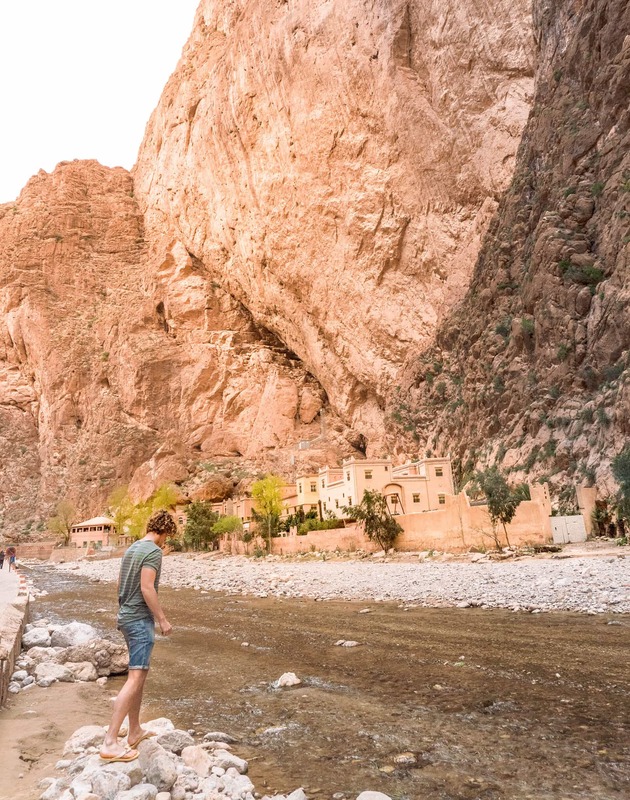 Once the sun begins to set you will stop in Boumalne Dades (or a nearby village) where you will spend the night in a traditional Kasbah. A kasbah is a house/palace under the control of a family where many families multiple families are living. From Dades to Marrakech was the most beautiful part of the route. You will drive through the Atlas mountains, where you probably will drive along deep cliffs and see snow. Visit Ait Benhaddou, a famous place where a lot of movie scenes are taken. Drink a good mint tea on top or buy a rug on your way down. Just before sunset, you will arrive in Marrakech. It’s quite a big distance to the Sahara from Marrakech or Fes. But once you’ve seen the sunset or millions of stars at night you already forget that the ride was beautiful but long. Are you leaving from Marrakech or Fes? What’s a good price for a Sahara Desert Tour? Price really depends on the tour you pick. We had a 3-day private Sahara Desert tour from Fes to Marrakech which costs around $700 including two nights, one at the tent and one in a kasbah, food, gas etc..
Of course, you can also share a minivan which makes the tour a lot cheaper. Most of the tours of four or more days will take you to really into the Sahara Desert. A two or three-day tours will take you to the Erg-Chebbi area is at the foot of the Sahara and also very beautiful. But if you have the time we really recommend going into the Sahara. We’ve arranged a 5% to 10% discount for you with the guys from Desert Days Tours. The discount depends on the length of your trip. We had an unforgettable time with them during our Sahara desert tour. For security reasons, we will email it to you. Fill in your email address right here. Just by leaving your email address. 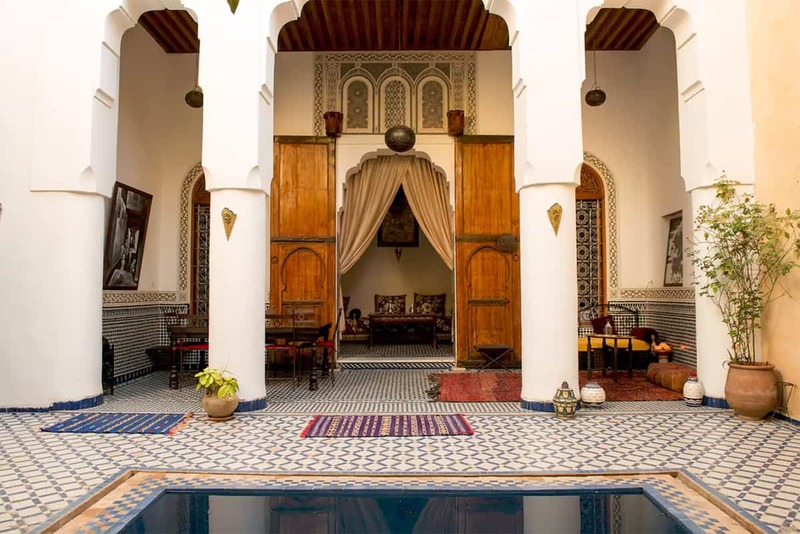 Riads in Fes or Marrakech are also available via Airbnb. We got a $20 Airbnb discount for you! We got a $20 Airbnb discount for you! Or see all riads in Fes. Just $30 a night! Use our discount code linked above. More expensive but better located and just as beautiful!